Aaron Pace is stuck in time and space in a place called the Lost Level. Anything can happen in this bizarre place where the sun never sets and the local vegetation can attack at a moments notice. 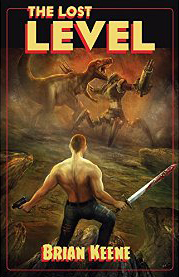 A place where a battling robot and a Tyrannosaurus Rex can actually happen, and Nazi spaceships can be stumbled upon during a walk in a grassy field. And where strange snake men with human flesh to adorn their scaly hides are a nemesis to any wayward traveler.